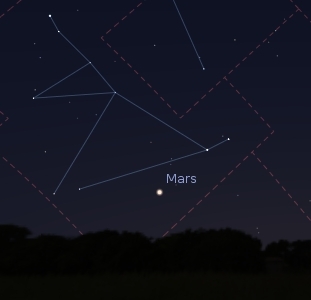 Mars is practically hovering in place in the west just as darkness sets in. You’ll see it in nearly the same place every evening at the same time all month. The stars behind it will drop into the horizon though. A thin crescent moon passes 7° north of the red planet on the 14th. Jupiter is at its best showing of the entire year this month. It’s up all night and close to the orange star Aldebaran. Jupiter will be 4.7° from Aldebaran early this month. The actual opposition date is the 3rd. You’ll get the best view of the planet in a telescope at this time. And if all you have is a pair of binoculars, it’s still a great time to take a look at Jupiter through them if you haven’t before. You’ll immediately see one to four tiny dots next to it. They’ll be in different positions from night to night. Those are the moons Galileo saw when he looked at Jupiter through his primitive telescope. The moon will pass in front of Jupiter on the 26th, if you happen to be in the right place for it. The occultation will be visible from eastern South America to southwestern Africa. Below Jupiter and Aldebaran is Orion the hunter. 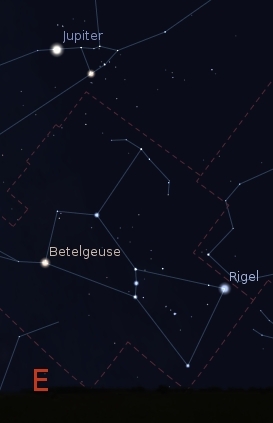 This most easily recognized constellation is followed by the nearly as well known Canis Major or big dog. Its brightest star Sirius is the brightest in our night sky. Leo’s up a few hours later, around midnight. And as sunrise approaches, Saturn rises below the bright star Spica in Virgo. Saturn rises earlier each morning and gets easier to see. Two planets are below it at the start of the month, but they are rising later and getting harder to see. Venus is the brightest of them. 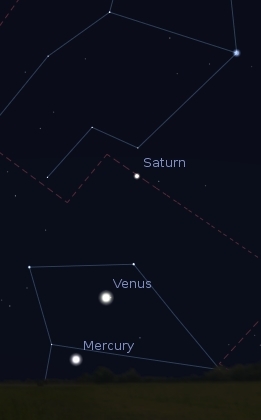 Mercury, at greatest elongation on the 4th, is below Venus. Those who have a very clear horizon may see Mercury fleeing from Venus in a slow morning-to-morning pursuit. Don’t count on seeing Mercury late in the month as it heads into the sunrise. But Venus should still be visible very low. This could be a great year for the Geminid meteor shower. The peak is around the 13th and 14th. The moon is close to new around that time, so it won’t wash out the show. The Geminid shower can produce up to 50 meteors per hour and in many colors. The southern solstice is on the 21st. Around that time is when nights are longest in the northern hemisphere and shortest in the southern hemisphere. There has been a lot of hubbub in recent years about some great galactic alignment that’s supposed to occur on December 21, 2012 and bring about the end of the world. Astronomers don’t know of any alignment that will happen on that date. The only thing certain to happen on Earth that day is someone will start predicting the next supposed end-of-the-world date. So plan on enjoying astronomy into 2013. ¡SkyCaramba!